Today’s newspapers are full of storms and the story about the USA trying to establish a colony on China’s eastern flank, pardon me, North Korea’s hydrogen bomb test. In Yemen, every ten seconds, one child dies from malnutrition, while the Western Trusted Friend and great ally Saudi Arabia strafes aid convoys. And kids. And not a word is spoken. Since you started reading this piece, one child has gasped his or her last breath in Yemen, emaciated, skeletal, dehydrated, a defeated and enquiring look in its eyes as they open wide one last time looking for a way out, looking for help, looking for a hand for those trusting fingers to hold, looking for a lease of life which should be their birthright. None comes. 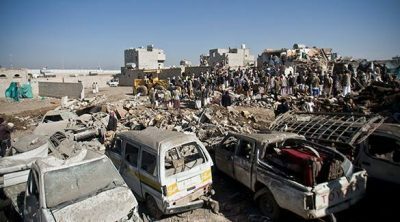 What does come is a Saudi air strike which destroys the aid that has been sent to save them. Why? Because the Iranians are helping the side which is opposed to the faction Saudi Arabia backs. And the children are responsible of course. Aid agencies are stretched trying to cope with the catastrophic humanitarian disaster which has been brewing for years and now culminates in five hundred thousand cases of cholera, overwhelming the healthcare system. A new UN report was released this week. It makes for shocking reading, stating that international humanitarian law has been systematically violated since September 2014 – for three years – as civilians are slaughtered by airstrikes without any regard for norms of safety or rules of engagement. The report documented 8.749 civilians injured and 5.144 killed between May 2915 and August 2017. Of these, 1.184 children were killed and 1.592 were injured. Thousands of children is not collateral damage, it is an act of wanton murder and genocide. The report states that coalition airstrikes are responsible for the majority of these deaths. It goes further, accusing the coalition of killing no less than 3,233 civilians. The airstrikes have included funeral gatherings, fishing vessels, schools, hospitals, markets, residential areas and public and private property. The situation is in one word, a calamity. In Yemen 7.3 million people are in danger of starving to death, described as being “on the brink of famine” by the report and a further 18.8 million people need humanitarian aid. This, according to the UN, is a “direct result of the behavior of parties to the conflict”, citing “indiscriminate attacks, attacks against civilians and protected objects, sieges, blockades and restrictions on movement”. “Operations were conducted heedless of their impact on civilians without regard to the principles of distinction, proportionality and precautions in attack”. In one such attack on August 23 this year, a military aircraft strafed the Istirahat al-Shahab Hotel in Bayt al-Athri in Arhab district. The building was seriously damaged, 33 civilians were murdered and a further 25 injured. The culprit? “Coalition forces” led by Saudi Arabia. Such attacks are prohibited under international law. Not surprisingly, the international community has scant information about what is going on, because the Western Trusted Friend, Saudi Arabia, has blocked access to journalists trying to cover the conflict. This is not only about Saudi backing the Government against the Houthi rebels (backed by Iran). It is about a regional power struggle between Sunni Saudi and Shiite Iran. But the Yemenis are the pawns. Especially the children. And the Iranians are not party to the bombings. And where are the Saudis’ western friends in all of this? Selling them weapons, of course. Why, the US administration has just secured a 100 billion USD arms deal. So, while the west, which includes European countries, does deals with Saudi Arabia and shakes hands smiling politely with those who spend weekends in Casablanca doing God alone knows what, Yemeni kids are being murdered. Of course, a barrel of oil is worth how many children’s lives? Ask Theresa May and Donald J. Trump. Timothy Bancroft-Hinchey has worked as a correspondent, journalist, deputy editor, editor, chief editor, director, project manager, executive director, for TV stations and media groups printed, aired and distributed in Angola, Brazil, Cape Verde, East Timor, Guinea-Bissau, Portugal, Mozambique and São Tomé and Principe Isles; the Russian Foreign Ministry publication Dialog and the Cuban Foreign Ministry Official Publications. He is Director and Chief Editor of the Portuguese version of Pravda.Ru.